Deposit $300 (required upon registration). Cost includes tuition, fees, food, lodging and daily transportation to the sites. Cost does not include airfare to the Island . Roundtrip airfare from US to Hilo ranges between 600 and $1200 depending on starting point. Introduction: The 5800 km-long Hawaiian-Emperor Seamount Chain reveals the relative motion of the Pacific Plate over the past 100 million years and provides the Earth’s most dramatic illustration of hotspot volcanism. The Big Island of Hawaii, which currently overlies the hotspot, hosts the World’s Tallest Mountain (Mauna Kea, as measured from base to peak), the World’s Largest Volcano (Mauna Loa), the World’s Most Active Volcano (Kilauea), and the Most Deadly Volcano in the US (Kilauea). Projects will investigate past and present volcanic and tectonic systems of Hawaii. Some projects are integrated with initiatives of the USGS Hawaii Volcano Observatory (HVO) to monitor current activity and volcano hazards of the Big Island of Hawaii. Prerequisites: Physical geology, mineralogy and/or petrology required; structural geology, and volcanology helpful but not required. Projects: Geologic field mapping of basaltic lava flows and pyroclastic cones and quantitative assessments of geodetic data from the Kilauea volcanic complex. The course includes instruction, practice, and independent work involving field techniques for assessment of volcanic hazards associated with active tectonic processes on Kilauea Volcano and surrounding regions. Field techniques will include traditional field techniques for completing small- and intermediate-scale geologic maps and stratigraphic columns, Production of simple digital maps from GPS data, as well as geodetic measurements using traditional and advanced instruments. Written reports and memos will accompany compiled maps, sections, and other products derived from quantitative assessments of field data. Instructional Methods: Students will receive field-based background instruction, collect field data, analyze and interpret data, and communicate activities via written reports and memos, compiled written and digital maps, sections, and other products derived from quantitative assessments of field data. Students will have opportunities to observe lava entering the ocean and, depending on conditions, directly sample lava (with a quenched age of zero) with a hammer. Physical Demands: Field work will involve working in rugged and steep terrain covered with fresh lava fields (sharp, jagged, and unstable surfaces). Some activities may include long hikes of considerable length over challenging terrain. Students are expected to be physically and mentally prepared to work in these conditions. 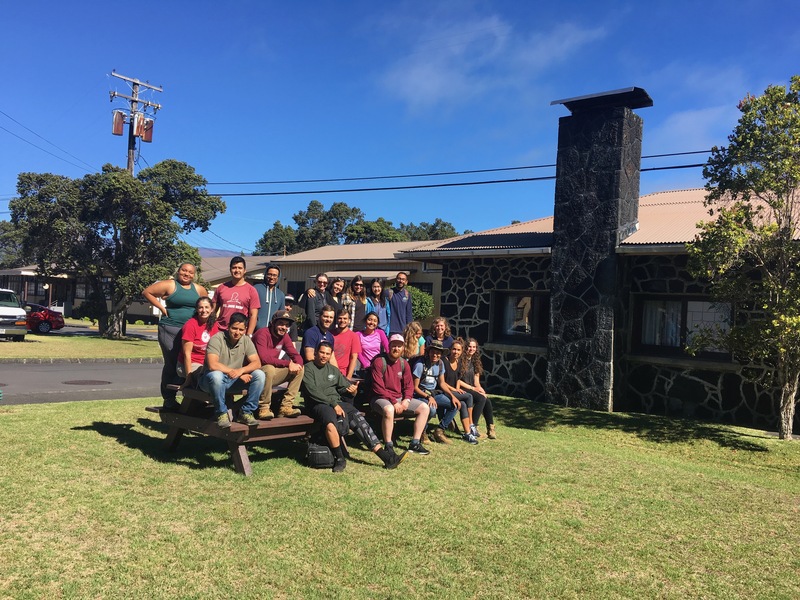 Facilities: Lodging for the program will be in dormitory-style setting at Kileaua Military Camp (KMC) on the edge of Kileaua caldera and a short walk to the USGS Hawaii Volcano Observatory. Necessary data compilation and analysis and report-writing will be based out of KMC. KMC hosts a cafeteria, snack bar, general store, and laundry facilities. Climate: Weather on the Big Island of Hawaii is somewhat unpredictable, but is generally warm in the summer with typical highs in 70’s and 80's(F) and lows in the 60’s. Students should expect variations of rain, mist, and clear skies on a daily basis. Geological Field Guide: Kilauea Volcano, R.W. Hazlett, Hawaii Pacific Parks Association, 162 pp., 1993. Field equipment: geology hammer, Brunton compass ,10x hand lens, waterproof field notebook, waterproof pen, fine point sharpie pen, 5 clear plastic sheet protectors, clipboard, with cover, 6-inch ruler, set colored pencils, hand-held GPS unit, calculator, laptop computer, headlamp or flashlight, small field backpack, insulated lunch bag, camera, 2 water bottles, first-aid kit with the following - Band-aids, Gauze pads, Medical tape, Neosporin, Tweezers. Field clothing: Rain jacket, pair of sturdy and supportive field boots (for traversing fresh lava, treacherous terrain, and long distances), pair of work gloves with leather palms, flece or thermal jacket, field shirts, long-sleeve (protection from sun), 3 pairs of field shorts, 2 pairs of field pants, 7 pairs of field socks, Hat, full-brim (protection from sun), sunglassesscreen and lip balm, swimsuit. Application and deposit of $500 online. BHNSFS reserves the right to cancel the camp if the minimum enrollment is not reached. The full deposit will be refunded in this case, and applicants will be notified via email. Faculty: Dr's, Richard Hazlett, Cheryl Gansecki (University of Hawaii, Hilo) and Nuri Uzunlar - Director, SDSMT, and HVO scientists.